For any artist, the process of bringing a design to life is a daunting time. They need to trust their creation will be manufactured exactly how they imagined. And that is how we helped London-based artist, Amanda Lwin. Amanda is a multi-disciplinary maker of things about places. She works with many different materials and chooses the medium for a piece according to what she is trying to express. Amanda aims to tell the visual story the material has within it and to uncover the stories that places and spaces tell about ourselves. 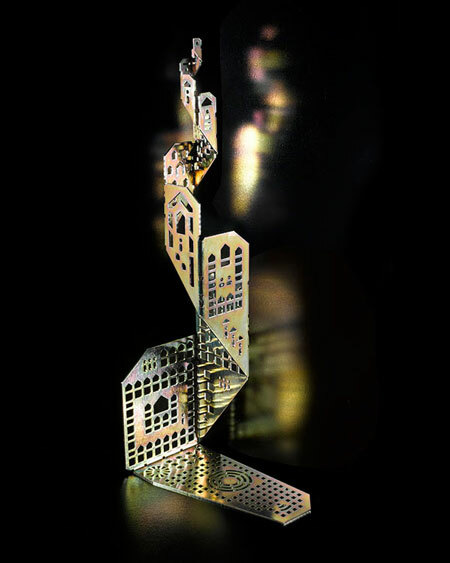 Amanda was contacted by British Airways when they needed a sculpture of an imaginary building to feature on the front cover of The Buildings Edition of their first-class magazine. With only a few weeks in which to design her sculpture, Amanda set about creating paper forms of her design ideas and then drawing them up on the computer. But to turn her imaginary building design into a solid sculpture, she needed the help of an industrial metalwork specialist. At ECAM Engineering, we provided laser cutting, polishing and press brake bending for Amanda’s artwork. And as our laser cutting machinery is accurate to 0.05mm, Amanda could be confident her sculpture would be exactly as her design. The sculpture was then sent to Diamond Metal Finishing in Stoke-on-Trent for Zinc electroplating. A short film about Amanda and her practice was also commissioned by British Airways. And as the film crew liked the environment at ECAM Engineering so much, part of the filming of this took place in our factory. As a full-service supplier for large companies like JCB and GKN, we regularly manufacture high volumes of precision fabricated components. So working with Amanda to make an original piece of art was a real pleasure for us. Our Managing Director, Phil Arme, said, ‘It was great to be involved with Amanda’s project and to create something so aesthetically pleasing for the art world. It was certainly something different for us and it also highlights the versatility of industrial metalwork’. The artwork Amanda created for British Airways uses the sculptural language she developed in her series, The Skyscraper Index. Visit Amanda’s website to find out more about her work. If you need specialist metalwork for a one-off project or have an on-going need for precision components, we offer a range of engineering solutions to suit your needs. Call us today, on 01538 757166 to find out how we can help your project take flight.